Dan, Rachel, Adam & I ventured down to Keuka Lake State Park this weekend for some Memorial Day camping adventures: wine tastings, waterfall hikes, and more! 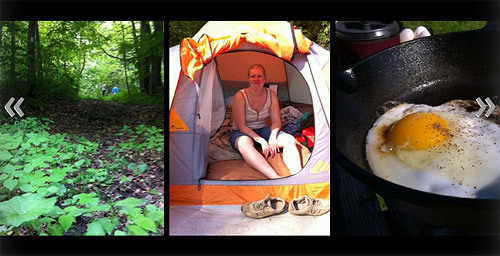 I whipped up a couple slide shows of the weekend using the Blurb mobile app that I’d been wanting to try. Click the image banners in this post to check out the photos, videos, and sound bites (once loaded, use the left/right arrows to navigate, or click and drag to scroll, and click the “play” buttons for video/audio). We started by checking out the park, hiking down to the boat launch, and goofing around on the awesome playground. After that we drove along some of the Keuka Lake wine trail, stopped at three wineries, and did some tastings. We ate peanut butter sandwiches in the car, bought some bottles of wine, and enjoyed the gorgeous hilltop views of the lake before returning to our campsite for cheeseburgers & beer. After breakfast on our second day and then a short drive, Dan led us hiking to some amazing waterfalls. The first one was near the ruins of of an old mill. 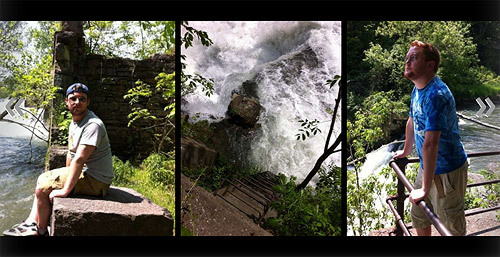 The falls were very full, the mist felt great on an 89-degree day, and the railings, walls, and old equipment were fun. The second falls were by the most perfect zombie film set you’ll ever find. A bunch of decaying buildings, bullet-hole-ridden, graffitied and crumbling, the place was amazing. Barn swallows flew in and out of the tall basement of one building that had developed an underground lake, vine-covered staircases, rusted lookout towers, and an extremely tall barn of a building (apparently involved in sulfur manufacturing in some way) were some of the amazing post-apocalyptic sights. After our first waterfall hike, everyone was exhausted so we napped — first on the ground and in chairs, before finally retreating to our tents. Shortly after waking up, Anna arrived so we went in search of another waterfall. Dan’s directions led us up an extremely steep dirt road, down a mostly unmarked trail into a shady forest, and across a stream that we had to build a rock “bridge” to get across before we saw the falls. 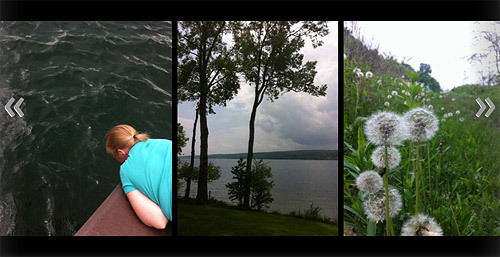 Afterward we stopped in Hammondsport to sit and stare at the lake, Anna waded in the water back at the park, and we had a very camping dinner of foil packet chicken & veggies. While sitting around the fire, we started getting nervous about the impending storm — weather reports from Dan’s father via text message and the increasing lightening — so we ended up packing everything up to drive home at 11pm. Thank goodness we did, too: the storm was intense with the most beautiful and scary lightening I’ve ever seen (the drive was NOT fun). Even though we arrived late and left early, it was a great & fun two days and I’m really glad Dan arranged it (Thanks Dan!). We ate tasty camping food, our neighbors brought us vodka-infused watermelon, my allergies went NUTS and I developed some sort of weird rash down both my arms that all-but disappeared by the end of the night, I ate a cherry and liked it (a huge step), and Anna caught a salamander. Plenty eventful! Ooooh, I’m glad you all came home early. I was thinking about you guys when the thunder and lightning woke me up, hoping that all my friends would still be ALIVE in the morning.